Today one of the founders of this service club is still active member Past President Les Whorlow, we thank him for his on going commitment and dedication. 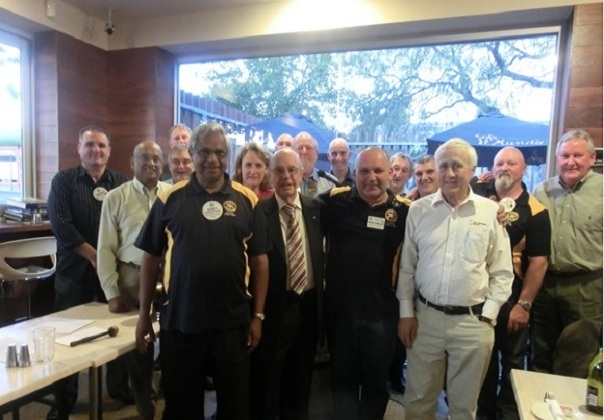 For more information on how the Rotary Club of Sunbury is structured see Click Here. We are part of the world wide fellowship of Rotary which began in Chicago in 1905. Rotary is broken up into districts and we are a part of Distrct 9790 which stretches from Sunbury to Holebrook and Finley in NSW. Our membership is made up of dedicated professional and business people who have a passion to help the community whether it be local, national or international and we are an incorporated body. See Join Rotary for more information on our membership. We currently meet at the Nook Cafe and Wine Bar, Evans St, Sunbury on Tuesdays at 6:30 for 7:00pm for dinner, where we have a lot of fun as well as instigating the important functions of Rotary in providing service to the community. At our meeting's we strive to have interesting after dinner speakers and other activities. If you are interseted in Rotary please contact the president or secretary or the club by email or telephone, details can be found on the home page. Establishment of Red Rock Outpost camp for youth of the district. Rotary Youth leadership Awards RYLA students sent to seminars. Sunbury Junior Fire Brigade band assisted with equipment. Sunbury Salvation Army- established emergency accommodation unit / furnished another. Establishment of Rotary park in Sunbury for the communities use. Rotaract club / youth programs initiated in Sunbury. Participation in Rotary Internationals Youth Exchange Program. DRIVE 120-youth driver training program. Bosnia relief Appeal provision of 16 water wells for Bangladesh. Asian Tsunami relief provided to the people of Sri Lanka. Many years of assisting The Rotary Foundation with its Polio Eradication program. Between 1985 and now the world fought and beat this debilitation disease. Assistance to the communities of Timor Leste ( East Timor ) as they rebuilt their country. Supply of an Ambulance for a Glaucoma Clinic in Nepal. Bangers on Brook, sausage sizzle for patrons of the local Night Club at midnight.